The oldest is a Bronze Age village of oval stone huts. 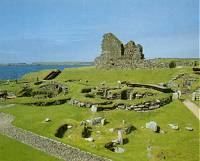 Above this there are an Iron Age broch and wheelhouses, and higher still an entire Viking settlement. On the crest of the mount is a house built around 1600. The visitor centre has displays on Iron Age life and the history of the site. At Sumburgh Head, about 22 miles south of Lerwick on the A970.